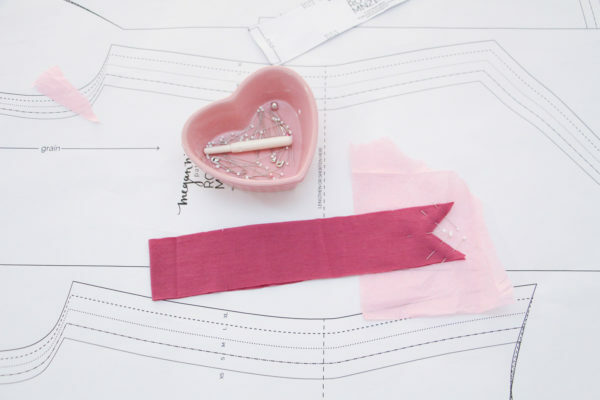 As per usual i think the trick to sewing a perfect V neckline in stretch fabric is preparation and taking your time. 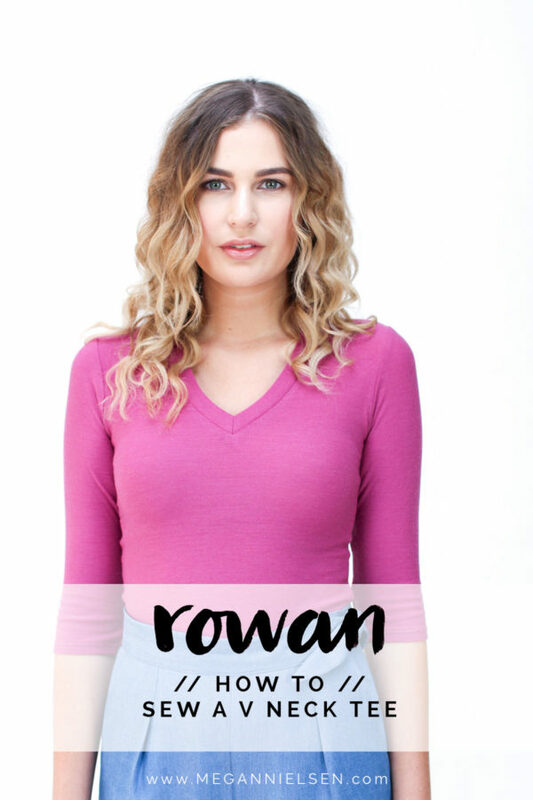 For our Rowan lookbook samples we used self fabric for the neckband, and in this tutorial i’m using a contrast fabric to make it easier to see whats going on. You can also use ribbing for your neck band to add a bit of a sporty look! Ok ready to get sewing? 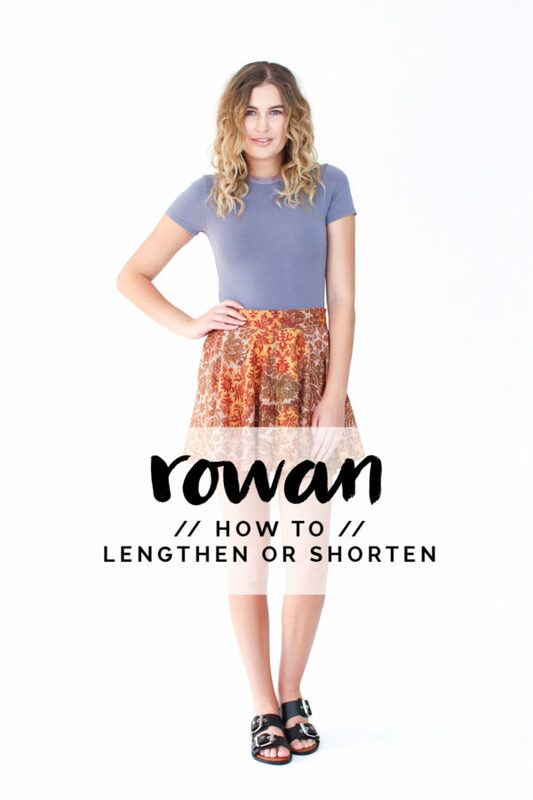 I have a really easy set of Rowan pattern alterations for you today! I’ve had a lot of questions on how to alter this pattern for a longer torso, and the great news is it’s a very straightforward adjustment. Click through for the steps! I am so thrilled to be kicking of the Rowan sewalong this weekend! 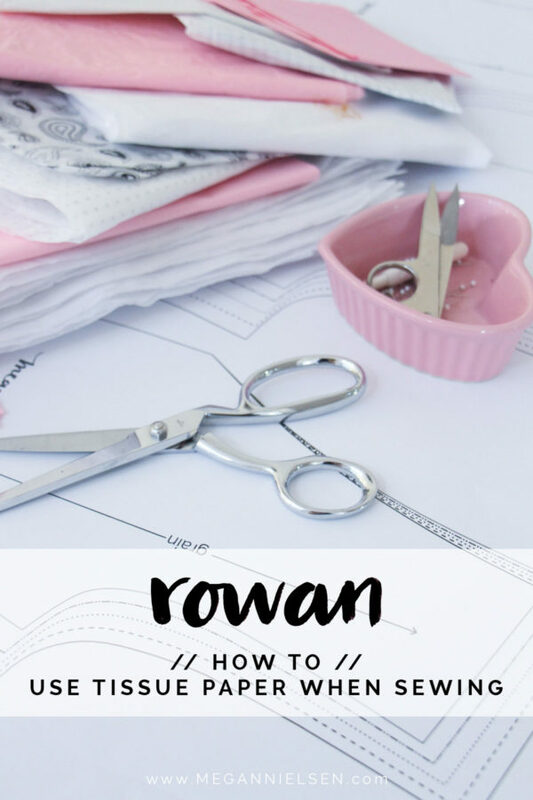 Today i’m going to share with you a few of my inspirations and ideas for making and wearing the Rowan bodysuit and tee! I have had a lot of fun collecting inspiration images on Pinterest, so make sure you follow the Rowan Pinterest board for ideas as i’ll be adding more daily. The Rowan pattern really grew out of a need I had in my own wardrobe for more basics. More of those wardrobe items that fill in the gaps and finish off outfits and basically make your wardrobe wearable. I am a real tucker in of tops and have a massive hatred for getting a cold back, so the bodysuit was a natural choice for me. It keeps your top tucked in perfectly all day, never leaves your mid section exposed and has the benefit of adding more warmth on a cold day. I see this pattern as a perfect companion for the extra special items in your wardrobe. It’s the top you reach for to go with your statement skirt. It’s the turtleneck you wear under your favourite dress to take you through winter. It perfectly pairs with pants for an elegant look or comfy casual look. It literally goes with everything. That’s my kind of basic. Given my desire to make it fill in wardrobe gaps, i went a little nutty on variations so we have 3 sleeve lengths, three necklines, plus bodysuit and tee options. At the moment one of my favourite ways to wear Rowan pieces is layered underneath something else. I have a lot of garments that only work in some situations or weather conditions – but throw a basic tee or turtleneck underneath, and suddenly that dress or tank top or whatever can be worn in a completely new situation! For this reason I actually tend to make a lot more of the bodysuit version. I’ve also found myself delving more into fabrics i wouldn’t usually sew with, as you can get away with using them in a layering piece. Things like sheers and stretch laces don’t usually feature in my wardrobe, but i am really enjoying using them as pieces that help me stretch the rest of my wardrobe through the entire year. I think it’s unlikely i’ll wear a sheer or lacey top on its on with just my bra showing, but i really love the depth it adds in the layering department when worn under something. Something I really love about Rowan is how easy it is to hack and create your own variations! I really want to try adding some statement sleeves! I’m thinking of mashing up the Dove flared cuff pattern piece with the Rowan sleeve and seeing what i come up with! I even like the idea of just creating a large rectangular cuff with the a slit up the side just for something fun! 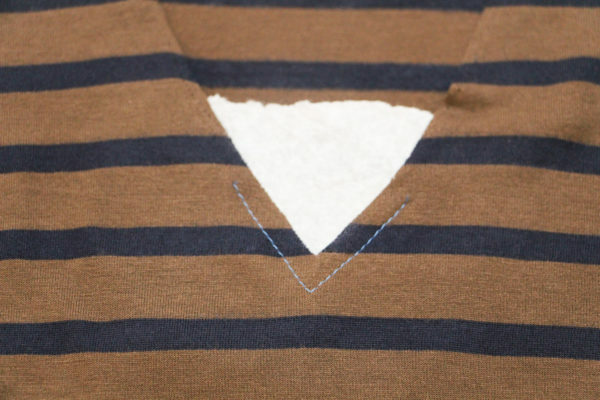 It’s really easy to change up the neckline too. I would like to try making a scoop neck version as well as just chopping off the shoulders completely and making an off the shoulder version. There are so many possiblities its kind of ridiculous. Since this pattern is a stretch pattern it’s pretty forgiving. When it comes to fabrics, the most important thing is to just stay within the stretch requirements. This pattern has negative easy and requires fabrics with at least 40% stretch. 4 stretch is even better but not required. I’m so excited to let you know that the Rowan sewalong starts this weekend! 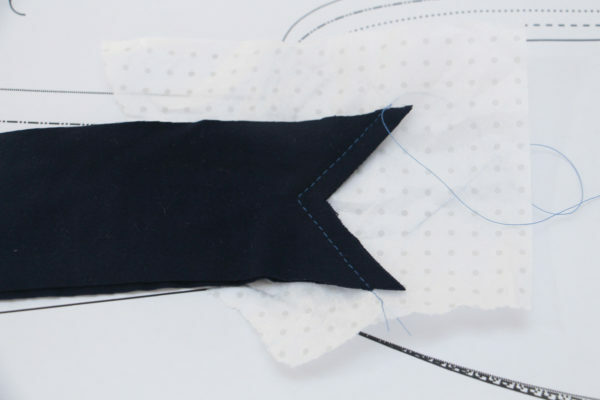 I’m going to do this sewalong a little different than usual, as Rowan is quite straight forward to sew i’m going to focus on the challenging aspects, as well as pattern hacks and variations. As per usual, if you have any ideas for posts you’d like me to include, please let me know in the comments! 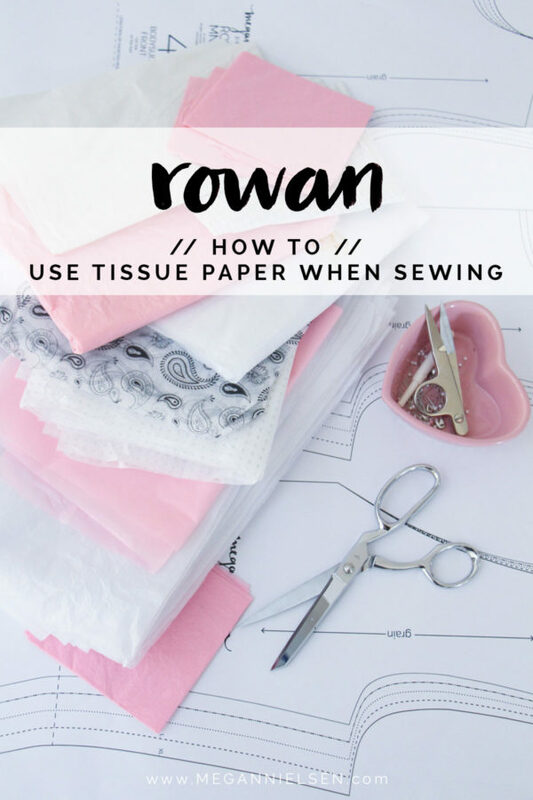 Before we kick off the Rowan bodysuit and tee sewalong in a few days time, i thought it would be good to do a little primer, with one of my all time favourite sewing tips. 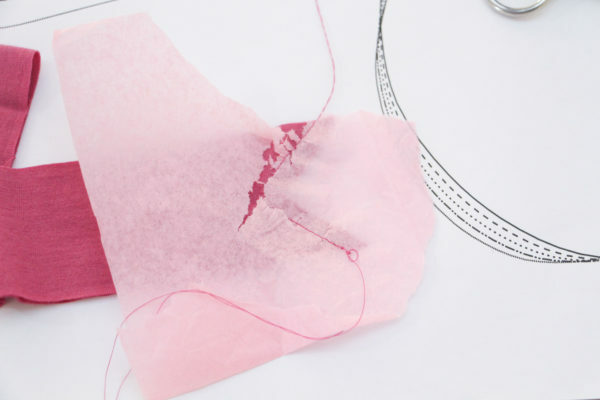 I love little sewing tricks and this is one that my Granny taught me when I was a teenager and close to crying about not being able to sew chiffon without my machine tearing it up. I’m sure I’m not the only one who has been in that situation. Ever sewn with a delicate fabric that keeps slipping as you sew or worse is being pulled down into the plate and being eaten up as you sew? Tissue paper is the solution! Simply place a layer of tissue paper under your fabric as you sew, that is between the fabric and feed dogs/plate. This will help stabilize it and give the feed dogs something a little more solid to grab onto. Once you’re done with your sewing you can just carefully rip the tissue paper away. 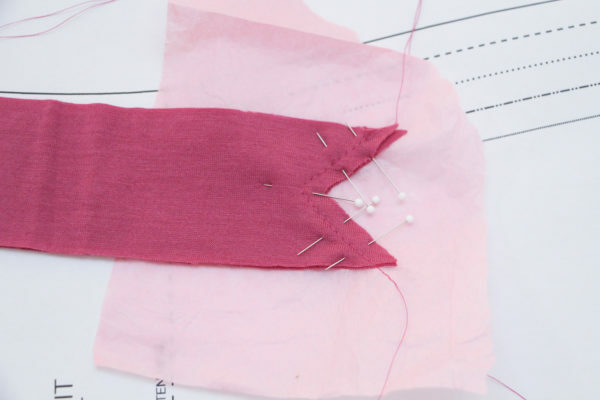 This is my favourite trick for sewing with super delicate fabrics like chiffon or crepe de chine. Works every time and removes a lot of headaches. It’s also very helpful when sewing slippery knits with small seam allowances and will be a huge help when sewing V neckline option on the Rowan tee/bodysuit pattern. 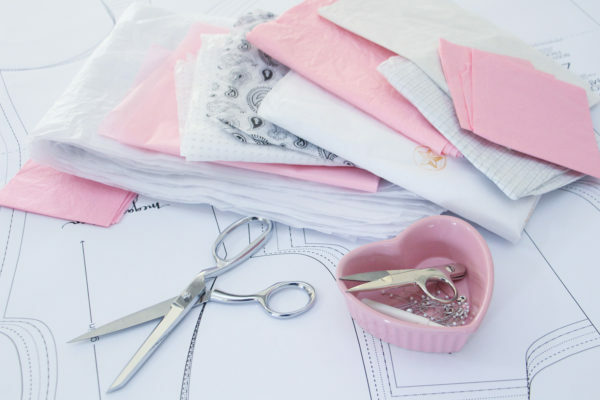 But there are even more uses for tissue paper even before you reach the sewing stage. 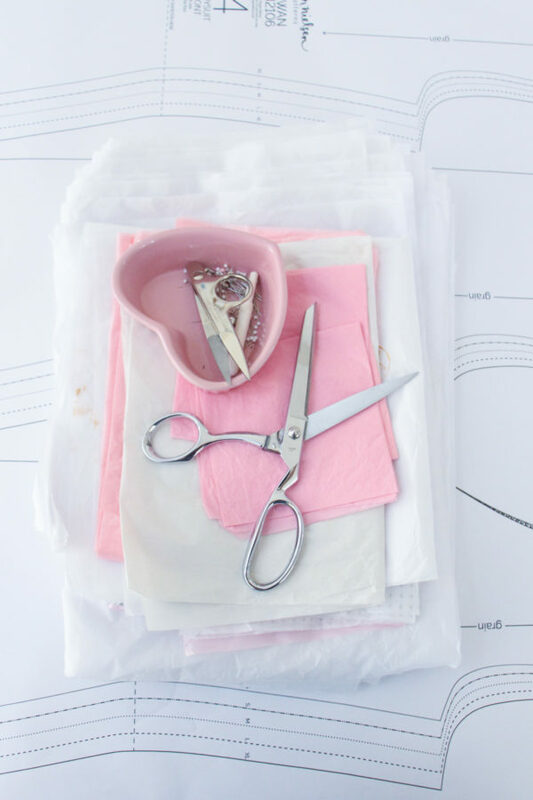 If you’re having trouble cutting slippery delicate fabrics (they have a tendency to slip right out of the fabric sheers), then place tissue paper under the fabric and pin them together before you cut. This will help you maintain an accurate cut and remove a lot of headaches for you! The even better news is that it’s actually pretty easy to get your hands on a nice stash of tissue paper. I have actually never bought any for sewing, because it’s included in wayyyy more pretty packaging than you’ve probably noticed. I have a drawer full of it, and pull it out any time i need to sew something slippery. 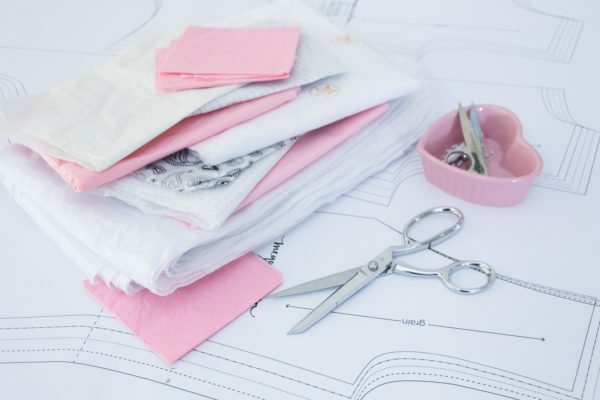 Start saving up all that tissue paper that people stuff in gift bags or wrap your purchases in, and hoard it like a crazy person, because it’s going to be your best friend when sewing with delicate fabrics. Any questions or ideas for other ways to use tissue paper when you’re sewing? Let me know in the comments!